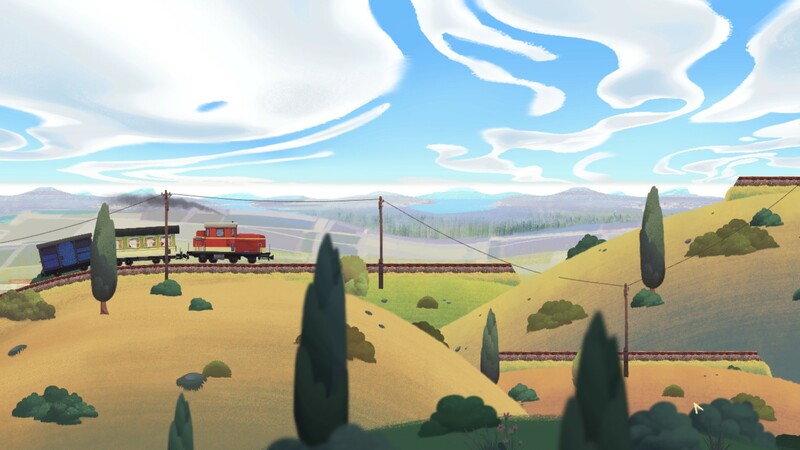 Have You Played... Old Man's Journey? I am neither old nor a man, but boy did Old Man’s Journey hit me right in the feels. I never thought I’d have much in common with a rotund, white-haired fisherman living on top of a cliff in a sleepy seaside village, but let me tell you, underneath his jolly, Father Christmas facade and his ‘awww, let’s herd some sheep and take a nice train ride’ puzzles, this guy has REGRETS. You wouldn’t think so at first, because developers Broken Rules have stuffed this (sort of) point and click adventure with so much charm and personality it’s bordering on being positively twee. It’s a beautiful world, full of life and colour and neat little flourishes when you click on bits of the environment. Its pastel-like textures and soft, watercolour hues only add to this feeling of ‘Ahhh, everything’s going to be all right, isn’t it?’ This bloke’s probably just got a letter inviting him to his grandchild’s birthday or something, and aww, look at him making all this effort just to get there in time for them to blow the candles out, isn’t he adorable? Reader, he is not making this journey for a child’s birthday party. I’m not going to tell you why he’s making this epic trip across this quaint countryside with nothing but a stick and the clothes on his back, needless to say, it packs an emotional wallop once you get there. Before all that, though, the journey itself is a delight. In fact, you should play it just to experience the brilliant bit set on a train. You see, Old Man’s Journey isn’t just two hours of guiding this elderly codger from point A to point B. It’s about manipulating its undulating landscape and straightening out his path so he and his tired old bones can carry on walking easy and hazard-free, whether that’s shrinking a giant, whacking great hill to the size of a small mound with a quick drag of your mouse, or knocking entire storeys off the local greengrocer’s so he can pitter-patter up their roof to the next bit of pavement (it’s incredible what people let you do to their houses these days, isn’t it?). The train ride, however, is just magnificent. You’re doing exactly the same thing as you were before, but now it’s in motion, the train driving ever forward as you drag hills and bridges with bits of track on them into the correct position. There’s no danger involved – the train will simply grind to a halt if you’re not quick enough – but the sheer speed at which our blessed old man is powering through toward his next destination nevertheless creates a frisson of tension and excitement. The scenery is stunning, the soundtrack has a new sense of urgency in its pizzicato strings and guitars, and you want to do everything in your power to make sure your man gets where he needs to be. He is on a mission, goddamnit, and I will not let him fail. For me, it’s the highlight of the game, which is a shame considering it’s all over within the first half an hour or so. While the rest of it never quite lives up to those few moments of gorgeous, locomotive glory, it’s still a lovely trip with which to while away a Sunday afternoon, so why not give it a go? I guarantee that whatever state you’re in by the end of the game, that train section will leave you with a smile on your face. Tagged with Broken Rules, feature, Have You Played, Old Man's Journey.